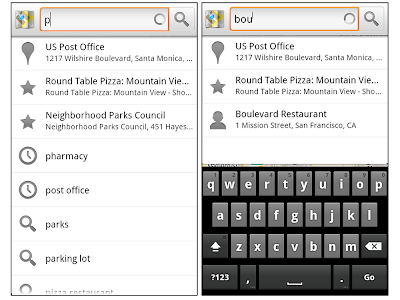 Today we’re releasing Google Maps 5.7 for Android. From Bangkok to Baltimore, we’ve added Transit Navigation (Beta), updated access to directions, better suggested search results, and a photo viewer to Place pages—all of which can help you whether you’re traveling to an unfamiliar part of town or visiting a city across the world. Google Maps Navigation (Beta) currently provides over 12 billion miles of GPS-guided driving and walking directions per year. Now, GPS turn-by-turn (or in this case, stop-by-stop) navigation is available for public transit directions in 400+ cities around the globe with Transit Navigation. Transit Navigation uses GPS to determine your current location along your route and alerts you when it’s time to get off or make a transfer. This is particularly helpful if you’re in a city where you don’t speak the language and can’t read the route maps or understand the announcements. After starting your trip with Transit Navigation, you can open another application or put your phone away entirely and Google Maps will still display an alert in your notification bar and vibrate your phone when your stop is coming up. Now you can spend more time enjoying the sights out the window and less time worrying about how many stops are left, where you are along the route or whether you missed your stop. Since Transit Navigation relies on GPS signals, we recommend using this feature for above-ground transit. 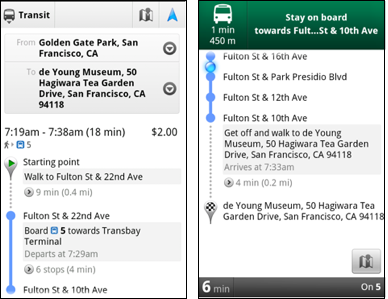 Now that we’ve improved our directions services, we wanted them to be incredibly easy to pull up on your screen. If you select the driving or walking icon and your route is supported by Google Maps Navigation, the Navigation icon will automatically appear so you can get access to step-by-step directions in one click. Note: this change is currently only in place for driving and walking and does not appear for public transit. We’ve also streamlined how you access directions from within a Place page. Before, clicking directions in a Place page would bring up options for “Driving Navigation,” “Walking Navigation” and “Directions.” Now, you’ll be taken straight to the map and see the new directions box shown above. Also, any place you got directions to or called directly from its Places page will be included as a suggestion for a relevant search. 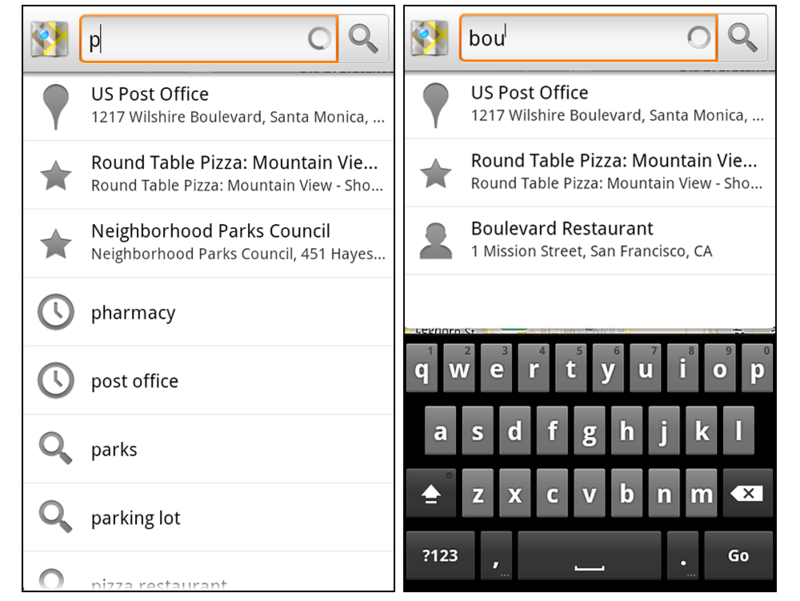 For example, if you recently received directions to the U.S. Post Office on Wilshire Boulevard, afterward, when you begin a search with [p] or [bou], that U.S. Post Office would appear as a search suggestion. Since we released business photos for Place pages last October, millions of photos have been added to Place pages around the world. To enable you to view these photos on the run, a slick new photo viewer has been added so you can browse photos while deciding where to go. 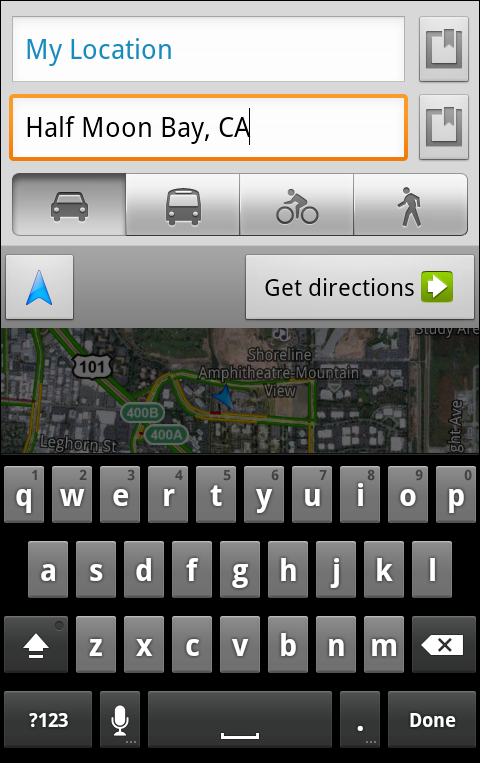 To start using Google Maps 5.7 for Android, download the update here. This update requires an Android OS 2.1+ device and works anywhere Google Maps is currently available. Learn more at our help center and have fun exploring, whether it be by car, transit, bike or foot. Transit Navigation sounds so cool. Please, please add full London public transport to Google Maps (tube, trains, overground, buses, etc.). I cannot say anything about other cities but in Ostrava, Czech Republic, the lines are completely wrong, not aligned with streets, going through buildings, like "point to point lines" directions for missile attack :) Some stops are even missing... This is certainly not something I would ask for help when in Ostrava. Cool! And what about clickable url links in buzz messages into google maps? most of the time when I need a map, I'm somewhere I don't know and probably don't have signal! How do I increase the 10 mile radius for downloading maps to say 100 of 1000 miles? When Google navi get ready EU countrys ? Google Maps/Latitude has NEVER found my home, nor allowed me to check in, nor really anything as far as "home." Still would love more customization around Auto Navigation, such as being able to filet a section of a route to avoid, then have it re-route around that area. I find this being the most frequent reason for having to alter a route, which is very time consuming (AND DANGEROUS) during a trip/commute. Other suggestions would be to allow the user to look up the incidents on roads within a Navigation route, similar to the way you can when just looking at a normal map with the traffic layer turned on. Finally, adding route customizations such as "shortest", "quickest" "scenic" etc. would be nice too. what happened to the Buzz layer in Maps 5.7.0?! i've been using it ever since it came out and now it's gone?! please bring it back. Google Maps navigation is great as long as you stay in your country. Here in Europe, data traffic when you're abroad is insanely expensive so Google navigation simply isn't an option. We need downloadable maps before it will get any usage. Great! Please, pretty please, add public transport for Paris !! +1 for Navigation in EU and downloadable maps. Before this update I could make a route with subways here in Portugal, now it doesn't work anymore! 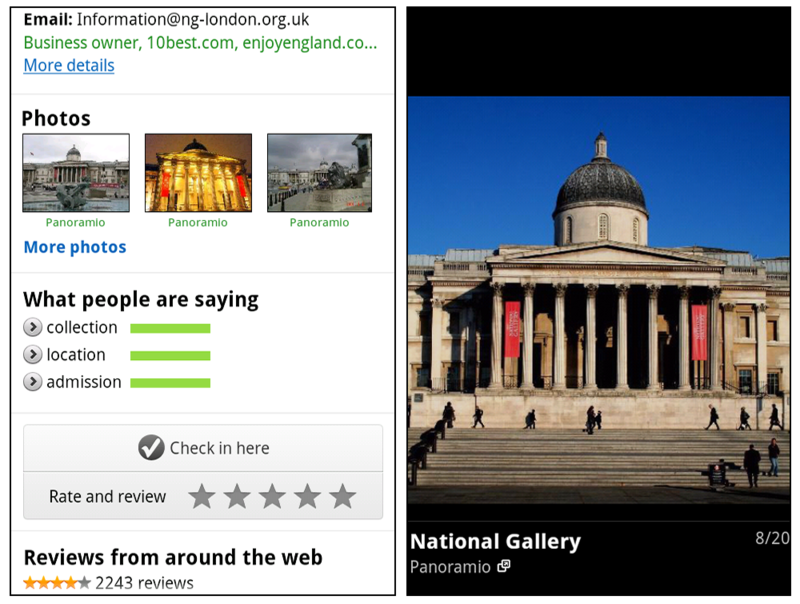 Would SO love to see Navigation on Windows Phone - please make it so. 1. Buzz me 5 minutes before the boarding time. I may be in a restaurant nearby the bus stop, and would like to be reminded about departing. It's a general rule to come to a stop 5 minutes prior. 2. Make buzzing a popup. The notification bar above the map uses small font, and having something bigger would be convenient. Once more, thanks a lot for this, it's so helpful to a person, who due to vision impairment cannot drive. My Maps (now MyPlaces) does not display properly. This has been broken ever since 5.0. Could someone in Google please get this fixed? Images don't display and the window can't be scrolled so a text entry cannot be read if the amount of text requires scrolling. Maps 5.0 works as do the versions of Google Maps for Blackberry, Windows mobile. Device Atrix & Android Emulators. Nice app for the Android. It work fine for me. There is the bug with the version 5.7.0 and without any version before. The bug is, we can use the bus line function in Google map not navigation between "Laguna Hills Mall" to "Hollywood", it gives me the route 83 and transfer to route 460. BUT, if I click on this path, the Google Map should frozen. I must force close it and the path can never been displayed. How do I keep the navigation screen from going dark? I need more time to plan my next turn, my vehicle weighs around 80000. Also, search map has changed and is now searching stared places only, if the name matches. I now have to switch accounts to search for the map items I need. For example; Pilot fuel stops, etc. Can this be fixed? Thanks. How do you remove the notification bar that shows when you're viewing your route? With this and the search bar, that's 20% of the screen wasted on useless junk. There are apps with ads that are less intrusive. What are you guys on? Do you not actually want to show the map at all? I've gone back to 5.6.2. I'd go back to a version without the search bar if I could. The country of MEXICO is located in NORTH AMERICA, not Central America. Hope you can correct this, as a matter of accuracy in your maps' data. Thanks for the great job with maps. This broke something. Latitude app check-ins no longer appear in the Latitude History on the website. I have been checking in with the Latitude app. I've only checked in with the Google + app like once I think, and that was on July 1st. Otherwise, I've always been using the Latitude app. I downloaded the latest upgrade to the Maps app [ version 5.7.0 ] on the day is was released (which was July 6th). On July 6th, my Latitude Check-in to my workplace shows up fine in Latitude History, but since I updated Maps at work on July 6th, none of my check-ins after that one have appeared in the Latitude History. I have a Motorola Droid 2 Global. Why is the destination coming up on the screen? How to remove the same. Along with the search bar, it is eating up 35% of the screen space on Landscape mode on the phone. Morover the current position marker is now 10% below the destination Notification. Please have a function to disable this. Else Google maps has become unusable while driving for me and so many others.